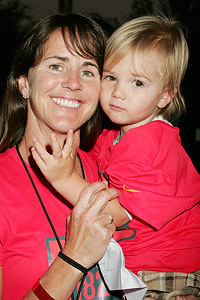 Ten years ago today, Brandi Chastain became an icon. In front of 90,000 fans at the Rose Bowl and 40 million fans tuning in around the world, Chastain netted the winning penalty kick in a shootout against China to win the 1999 Women's World Cup. She celebrated by taking off her jersey and falling to her knees in her sports bra, fists clenched. Roberto Schmidt/AFP/Getty Images Simply put, one of the most memorable sports images in our era. I knew it as soon as I saw it. We all did. We knew right then and there that it was a watershed moment. Chastain's epic, unscripted soccer celebration is our lifetime's seminal moment in women's athletics. Ten years later, Chastain, who turns 41 on July 21, remarkably is still playing professional soccer. She's also an activist, an author and a mom. But no matter what else she does -- like Bill Buckner and Bobby Thompson -- she will forever be remembered for one thing, and one thing only. I spoke with Brandi on the phone on the eve of the 10th anniversary of her life-altering goal. From her home in the Bay Area, she spoke candidly of life since The Sports Bra Celebration. "It's still so vivid. You're completely drained at that point -- after an entire soccer game, in PKs [penalty kicks]. You're so exhausted and your adrenaline is so heightened that your senses are actually so acutely aware of every sensation -- the sound of the fans, the heat radiating from the ground, muscles tired, stiff and sore. I'll never forget any of that." "It's funny, I remember being completely fascinated by the huge crowd at the game, but all I remember thinking once the ref handed me the ball was how amazingly quiet 90,000 people can be. In those few seconds, all I could hear was myself breathe." "It was complete slow-motion between my foot and the net. I remember watching the ball, seeing it spin with the logo and stitching -- I mean, it was that slow, almost on pause. And then it hit the net and the crowd erupted and it's back to real time and the team is running over piling on." "I mean, it was just what happened, exactly how it happened, as I was feeling it. It was spontaneous emotion. At a moment like that, your emotions completely take over and it's just raw reaction and feeling and sensation. You don't think, you just are. You're right there in it and those feelings -- when they're that raw -- are never wrong. That's the honest truth of the emotion of the moment." AP Photo/Mark Lennihan Chastain made all sorts of public appearances after her World Cup-winning kick and pose. "The media storm was difficult. It was a real test of composure. I felt like I was living on airplanes and constantly sharing the story -- which was awesome, and so absolutely worth everything because the opportunity and experience was so positive. But at some point it all hits you. It's a lot to take in. I was amazed and exhausted. "One of the most incredible things I learned from all this, or the oddest thing about it all, was that I was, all along, a person that played soccer. That's what I did. I was an athlete -- talented, OK, but not some kind of a know-it-all. All of a sudden, literally overnight, people want your opinion about things that you probably have no right to even be talking about. It's so interesting -- people think that just because your face is famous or you're well known that your opinion is more important than someone else's. It's an interesting situation to be put in. I eventually had no problem saying I don't know, or telling people I'm not qualified to answer their questions about things I don't do." ' And I'm like, yes, yes. But then he shouts to the whole warehouse! It's funny, though. I appreciate the enthusiasm and the huge smile. You have to." "Yes, it's had quite an eventful life, hasn't it? I'm very happy to have it back in my laundry pile. No, just kidding, it's in a frame somewhere -- behind glass now, or something, that will be making the rounds for the '99 anniversary tour." "The message of that moment and the entire accomplishment of that '99 team was teamwork. Every player on that team, every woman, was an important part of it. And the ads told that story, and what we put on the field confirmed it. It was so impactful, because it made people believe that anything was possible. It had that 1980 hockey moment effect. It was wonderful and motivating and gave you ambition and hope, really. The way we won and the personalities and their stories made it possible for women's soccer to fill football stadiums. It really changed the way people looked at life for a while. I really believe it changed society, not just sports or women's sports. "I'm so proud of the good things it continues to do for great people." David Livingston/Getty Images Chastain is still playing professional soccer, while raising her son too. "Parenting is far and away the most difficult and enjoyable thing you could ever do. Keeping up with [3-year-old son] Jaden makes soccer feel like a breeze. I love it. He keeps me on my toes and I've had such amazing precedents set by other moms like Joy Fawcett and Carla [Overbeck] and Danielle [Fotopoulos]. It's great, we all still keep in touch and have lots of stories to share." "I started a non-profit for young girls called the Bay Area Women's Sports Initiative -- BAWSI, so we're bossy girls! Today we're at upward of 5,000 girls, and we've expanded and added a program for their moms and women in the community. I'm also working with tween girls and their parents, along with a director of adolescent medicine from Stanford that stirs interaction about everything from family stuff, to sports, to the music they like. Beyond that work and playing [currently for the FC Gold Pride in the inaugural season of Women's Professional Soccer], I also do motivational speaking for schools and corporations, and I did some commentary for the Olympics [in Beijing]. I had a baby, and there's also a book, and a TV show. "So yeah, when people ask what I've done since '99, I ask, what haven't I?" Mary Buckheit is a Page 2 columnist. She can be reached at marybuckheit@hotmail.com. Mary Buckheit started as ESPN.com's college intern in 2000. She signed on full-time as an editor in 2002 and became a Page 2 Columnist in 2006. She went west to cover life in California, the UFC, AVP, X Games and anything else she can dig up under the sun.